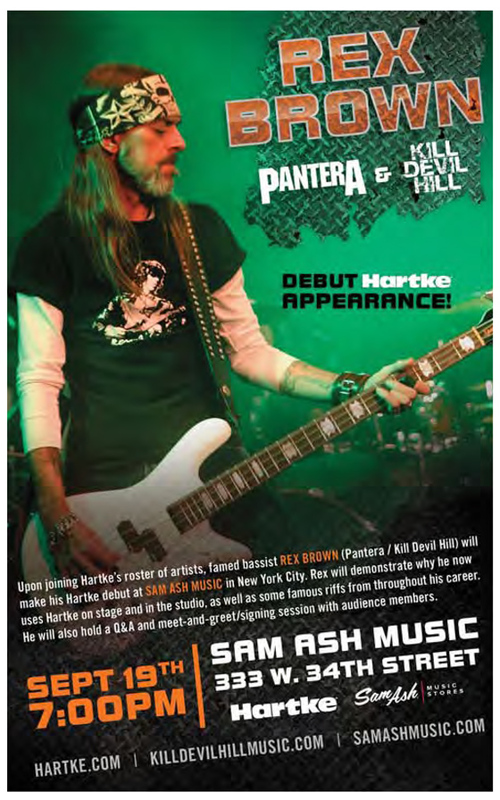 Dudes: Rex Brown, Pantera and Kill Devil Hill bass player, is coming to Sam Ash 34th Street on Thursday, and rumor has it there could be surprise guests. I wasn't a big Pantera fan before I saw them live at a venue outside of Baltimore around 1990, but after that gig I became a solid devotee. Groups like Pantera and Alice in Chains in the early '90's acted as welcome palate cleansers after the proliferation of hair metal groups in the late '80's. Thus Pantera will always hold a special place in my heart. Also, I can't wait till I'm driving my daughter and her friends around town, listening to their tunes on the radio, and embarrassing her with "Metal just isn't what it used to be. When I saw Pantera back in the day..."
See you at Sam Ash's 34th Street Superstore this Thursday!